RESTful web services are a way of communication among computer systems. REST services are based on REST architecture. World wide web has resources like images, videos, web pages and other business information. Web service clients use URIs to request these resources. Response to the web service request can be in JSON, HTML, XML or some other format. In a previous tutorial, you learned about SOAP web services in php using nusoap. 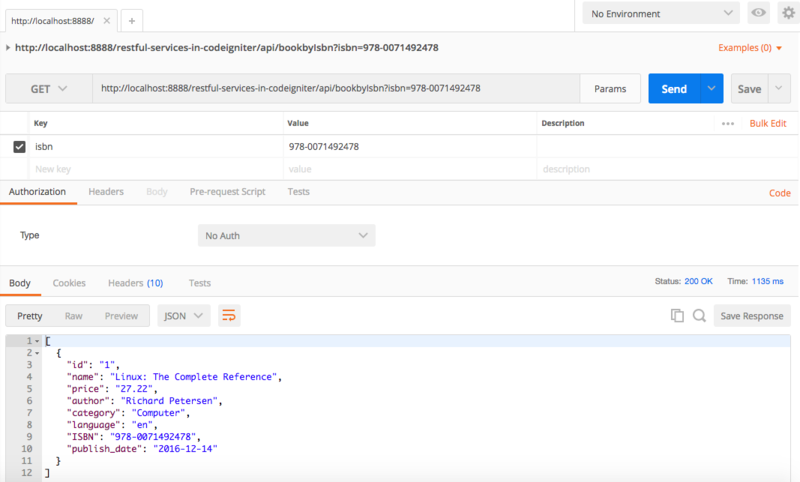 This tutorial is about how to create a RESTful web services in CodeIgniter. A resource cane be created, modified or deleted using HTTP methods like GET, POST, PUT or DELETE. To create restful web services in CodeIgniter, following tasks would be performed. 4. Create a RESTful library file, a model and an API controller to the application. 5. 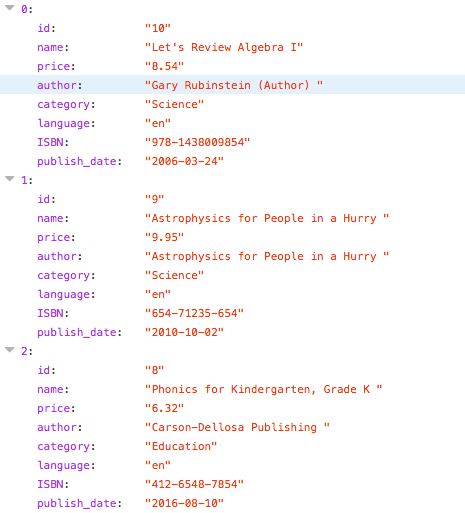 Create API methods to fetch a book information via ISBN or fetch all books records. In order to create RESTful web services in CodeIgniter first, you have to install PHP, MySQL. If you have not installed PHP and MySql, then visit WAMP or XAMPP website, download and install PHP MySQL. After installation, open PhpMyAdmin. Click on SQL tab and execute queries given below. -- Table structure for table "tbl_books"
-- Dumping data for table "tbl_books"
As we have to create RESTful web services in codeigniter; so latest codeigniter version is required. Visit codeigniter website and download latest version of codeigniter and unzip it. Create a folder restful-services-in-codeigniter in htdocs or wwwroot folder of your php installation. Copy the contents of CodeIgniter folder including application and system folder. Rename application folder to appx and system folder to sysx. Add code given below into the file. Normally when you access a CodeIgniter controller URL in the browser, it is of the form http://localhost/projectname/index.php/welcome so in order to remove index.php from the URL, settings are changed as above. Open database.php file in appx/config path and change database settings. Update hostname, username, password and database name according to your MySQL installation. Visit Github CodeIgniter rest server repository and download following files and copy to project directory as described below. Adding these files to project is necessary to create RESTful web services in CodeIgniter. Open libraries folder and create a file REST_controller.php and add code from this file. Create a file Format.php and add code from this link. We are going to use following HTTP methods. Get method is used to fetch data about a resource. In CodeIgniter $this->get() method is used to get parameters from URL or Query String. POST method is used to create a new resource. $this->post() method in CI is used to access values sent by client. To update an existing resource PUT method is used. CodeIgniter’s $this->put() method is used to access values. To delete a resource this method is used. In CodeIgniter $this->delete() method is used. In this tutorial on RESTful web services in codeigniter, we have to create a model for books. Open Models folder and add a file Book_model.php. Add following code into this file. This book model class is extended from CI_model class. In constructor database class is loaded. getbookbyisbn method is defined. This method fetches a book record based on ISBN. $this->db->get() method returns a result object. num_rows contains rows in result. If there is a record then result array is returned. To fetch all books from a database getallbooks method is defined. This method selects and returns all books records. Delete method is defined for deleting a book record. It accepts id. Id is passed to $this->db->where. $this->db->delete method is called with tbl_book. If query is executed successfully record is deleted and true is returned. To add a new record to database, Add method is created. Add method accepts $data array containing values for all columns in tbl_books table. $data array and table name tbl_books are passed to $this->db->insert method. On successful insertion true is returned. To update an existing book record, update method is defined. This method accepts id of record and a data array of values to be updated. In $this->db->where clause id is passed and then in $this->db->update data and table name are passed. Data is updated successfully and true is returned otherwise false is returned. Let us create an API is required so that clients can access API methods. Open controllers folder. Add a file API.php. Add the code below in this file. //API - create a new book item in database. In the code above REST_Controller.php file is included from libraries folder. An API class is added and is extended from REST_Controller class. In class constructor, parent constructor is called and book model is loaded using $this->load_model method. In the code above note that HTTP methods get, post, put and delete are used with each method name. But when these methods are called from a client get, post, put and delete are not used. To fetch record from a database _get is added with function name but to create a new resource or to update _post or _put and _delete is used with delete method. To get a book information by ISBN the function bookByISBN is created. You can view _get added with function name. $this->get is used to get variable values from URL or query string. If no ISBN is specified by client then a response code of 400 is sent back to client otherwise this ISBN is passed to book_model‘s method getbookbyisbn. Result is returned to client using $this->response method with status code 200. Otherwise 404 status code is returned with message invalid ISBN. To fetch all books information books_get method is created. Model’s getallbooks method returns information about all books from database. In case of success result is returned with status code 200 , otherwise error is returned with status code 404. To create a new book, addBook_post method is created with HTTP POST method. 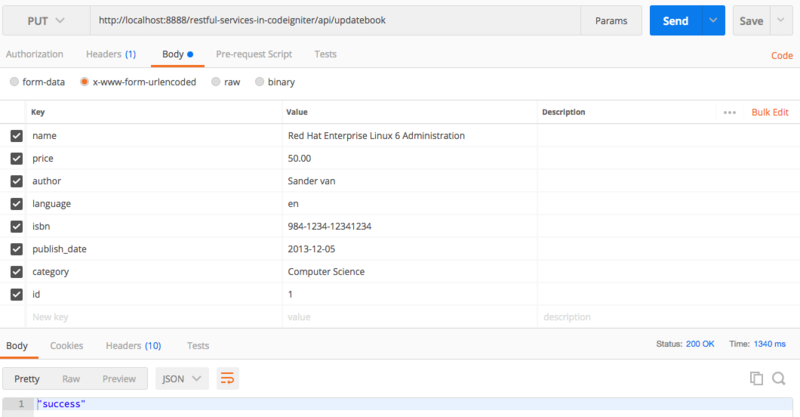 Client passes book information using post method from web service client. Using $this->post values are assigned to variables. If any of the value is missing response code 400 or bad request is send back with message to client. Data array is passed to model’s add method. If data is saved into database and a response code 200 is sent back to user with a success message, Other wise a 400 request code this sent back to user. In order to update a book information updatebook_put method is created. put is HTTP method to update a resource. All required values are assigned to variables using $this->put method. If any of required parameters are not sent by client a response code 400 with a message is sent to client. Otherwise book_model‘s update method is called and data array is passed with book id. On successful update success message with status code 200 is sent to user otherwise a 404 response is sent back. To delete a book record using API method deleteBook_delete() method is created. In the method $id is assigned using $this->delete() method. If there is no $id then a 404 response is sent to client. Otherwise $book_model‘s delete method is called. On success status code 200 otherwise a status code 400 is returned. Web services can be consumed by multiple clients. A client can be a PHP, ASP.Net application or a mobile app. In this tutorial creating restful web services in codeigniter we are going to use google chrome’s Postman extension. Open Google Chrome browser. Click Window menu in top menu and click Extensions. Click on the link Get more Extensions in bottom. In Search bar on left side enter postman and click search. In available extensions search results click on Postman and click Add to Chrome. After installation click on Launch button. Let us test web service. You can see in this extension user can select HTTP method, Enter request URL or can add params. If you click on the drop down with GET parameter value, other HTTP methods that can also be selected. In image below you can see address bar for adding web service URL with a button to add parameters. Clicking on Send button, web service request is sent to server. Open postman and add following URL in address bar. Here port 8888 is used by MAMP on a MAC system. Do not use port if If your WAMP or MAMP installation do not have it. Select GET from methods drop down. Next an ISBN is added as a parameter. Click on Params button. In Key textbox enter isbn and in values textbox enter 978-0071492478. Click on Send button and on success, result is sent back to browser. If you do not specify a parameter while calling to a web service a bad request is returned. If an invalid ISBN is entered then a 404 Not Found status code is returned with a message. To get all books records, you need to call books method, notice we are not using _get with this method call. In postman add the URL below in address bar. You can see in picture above, result is returned from web service. In order to test add new book method, let us first view existing records in database. Currently there are 10 records in database. 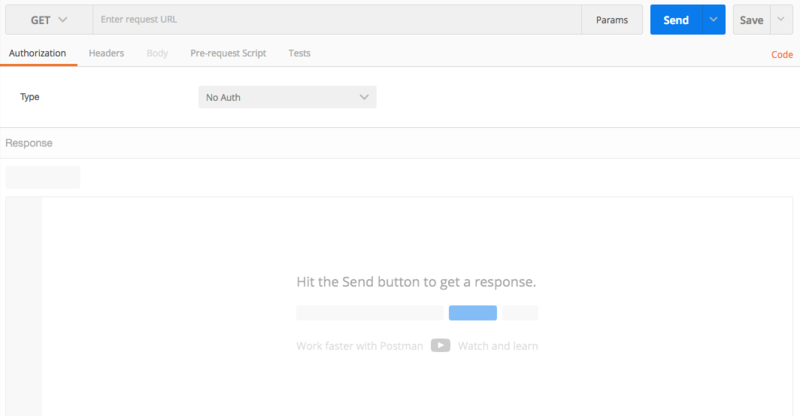 Now in Postman select POST from HTTP methods drop down. Add following URL in address bar. Adding a book using POST method, parameters are sent as part of body. Click on Body tab below address bar and select x-www-form-urlencoded radio button. There are text boxes for keys and values. Add all parameters for the new book. Key is the name of column and value contains the data to be saved. Like name= Complete Reference ASP.NET MVC and so on. After adding data, Click Send button. If insertion is successful a success message is returned. To update record of an existing book updateBook method is called using PUT HTTP method. Select PUT from HTTP methods drop down and add this URL in address bar.
. Click on body tag and select x-www-form-urlencoded radio button. See existing book record at id =1. In Postman add new book record in key value boxes under body tag. Add id key with value 1. After adding book information click Send button. You can see success message and updated information. You can view the updated record below. From drop down select delete method. Suppose you want to delete a book with id =11 from database. So in key value boxes add id as key and 11 as value. Click on Send button. Success message is returned from server after deletion of book. To summarize, in this tutorial you have learned to create restful web services in CodeIgniter. Then how to call and test web services using a client such as Postman Google Chrome extension. Hope this tutorial is helpful for you. If GIT is installed on your system, you can Clone repository. On command line go to the root directory (www or wwwroot) of your WAMP, MAMP or XAMPP directory. To download code on your system. Click on Clone or download link. Next, click on Download Zip link on right side of the repository.